Built by Lucius Copeland in Pheonix, Arizona (USA) the roots of the first Copeland 3-wheeler can be found in 1881 when Copeland began working on steam engines. 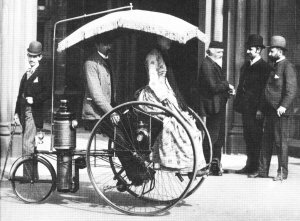 One of his steam engines managed to power a Columbia bicycle at 15 mph. As a result Copeland went on to manufacture the Copeland tricycle. Steam powered, this two seater vehicle had an automatic oil-fired vertical boiler that was mounted just in front of the single rear wheel. This transmitted power to the two front wheels which drove the vehicle whilst steering was via the rear single wheel. In 1884 the Northrup Manufacturing Company was set up to produce the vehicles and to prove their worth, Copeland, along with a director of the company drove a tricycle on a 120 mile round trip to Atlantic City. Manufacturer of the vehicles ceased in 1891.